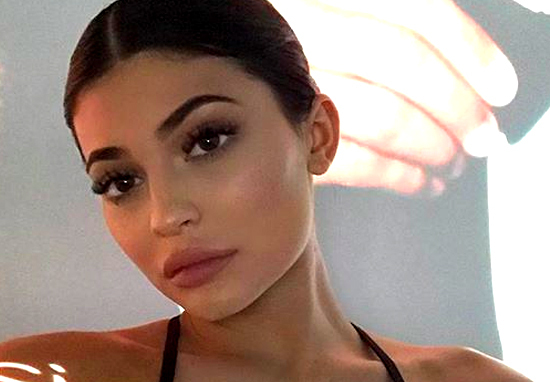 Kylie Jenner has been accused of ‘cashing in’ on her new daughter following the release of her latest make-up products. The 20-year-old who gave birth to her daughter, Stormi Webster, on February 1, kept her pregnancy a secret so she could look after herself away from the media. She has been fairly quiet for some time but is seemingly back to work after announcing the latest line in her Kylie Cosmetics brand. Kylie has named her latest line ‘The Weather Collection’, with one palette called ‘The Eye of the Storm’ and another named ‘Calm Before the Storm’. A few of my favourites #WeatherCollection launching Feb 28th inspired by my Stormi. I worked on this pretty much my entire pregnancy. Right after we chose Stormi’s name, her name really inspired me. I spent a lot of time on this collection and put a lot of detail into it… So I’ll try to show you guys all the fun detail. The new collection includes the two eyeshadow palettes, as well as matte lipsticks, glitter eyeshadows, lip gloss, and highlighter. The make-up’s packaging features silver lightning bolts and clouds, in an apparent nod to the little three-week-old. While most people have been supportive of the launch, Kylie Jenner has been accused of using her baby as a way of bringing in money. Personally, she said she had been ‘inspired’ by the name, which is actually a sweet sentiment. This is so cute I’m crying stormis own inspires collection ???????? It’s so sweet that she made this #weathercollection inspired by stormi I can’t wait till stormi growns up and see how great of a mom you been ? Kylie Cosmetics has grown from strength-to-strength since it was launched by the youngest sibling in the Kardashian/Jenner clan in 2016. On February 4, Kylie posted a full statement regarding her pregnancy on her Instagram page, as well as linking to an 11-minute YouTube video showing her nine-month journey. I’m sorry for keeping you in the dark through all the assumptions. I understand you’re used to me bringing you along on all my journeys. My pregnancy was one I chose not to do in front of the world. I knew for myself I needed to prepare for this role of a lifetime in the most positive, stress free, and healthy way I knew how. there was no gotcha moment, no big paid reveal I had planned. I knew my baby would feel every stress and every emotion so I chose to do it this way for my little life and our happiness. Pregnancy has been the most beautiful, empowering, and life-changing experience I’ve had in my entire life and I’m actually going to miss it. I appreciate my friends and especially my family for helping me make this special moment as private as we could. My beautiful and healthy baby girl arrived February 1st and I just couldn’t wait to share this blessing. I’ve never felt love and happiness like this I could burst! Thank you for understanding. The post announcing Stormi’s name has become the ‘most-liked’ post on Instagram, with more than 17 million likes and almost two million comments.